Wild Horses are horses which can be encountered in the wild. They will flee if approached, although they will attack nearby hostiles if necessary. A wild horse can be tamed by continuing to mount it until it breaks. Once tamed, the horse becomes an owned mount. If you switch to a different mount, it will slowly make its way back to the location you originally found it. Horse Whisperer: Purchase a map that lets you find wild horses. There are seven wild horses in total. The Unicorn acts almost identically to other wild horses but is documented elsewhere. 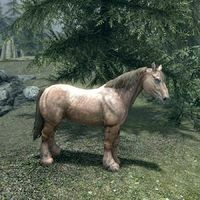 Although each wild horse is identified in your journal with a unique name, each creature on this list is simply named "Wild Horse". The descriptive names are used here for categorization purposes only. This Wild Horse has a black splotchy coat. It can be found northwest of Falkreath, just south of the map marker for Evergreen Grove. This Wild Horse has a chestnut coat and a dark mane. 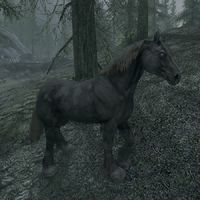 It can be found east of Helgen, along the path leading to South Skybound Watch. This Wild Horse has a pale dappled brown coloration. 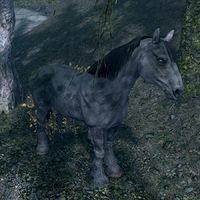 It can be found in the forest south of Solitude Sawmill, across the river but before you reach the dragon mound. This Wild Horse has a grey spotted coat. It can be found up the hill to the north of Salvius Farm. 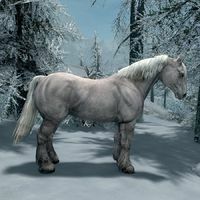 This Wild Horse has a pale white coat. It can be found among a group of snowy pines just south of Yngol Barrow. 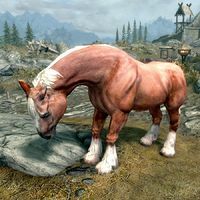 This Wild Horse has a red and white coat with a white mane. 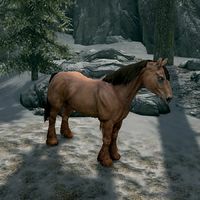 It can be found on the plains of Whiterun Hold, northwest of Whiterun Stables. 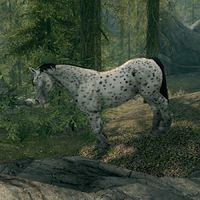 This Wild Horse has a white coat spotted with black dots. It can be found directly west of Stony Creek Cave, west of the road, on a green cliff overlooking the volcanic tundra below. This page was last modified on 2 December 2018, at 22:14.